Beat granulated sugar, butter, almond extract and egg in large bowl with electric mixer on medium speed 2 minutes. Stir in flour. Divide dough in half; cover half and set aside. Place remaining half on waxed paper or plastic wrap; press into 8-inch square. Sprinkle with 1 tablespoon each of the red sugar and blue sugar. Using waxed paper to lift, roll up dough. Repeat with remaining dough and colored sugars. Wrap rolls in plastic wrap and refrigerate about 1 hour or until firm. Heat oven to 375°F. Cut rolls into 1/4-inch slices. Place about 2 inches apart on ungreased cookie sheet. Bake 6 to 8 minutes or until edges begin to brown. Cool 1 minute; remove from cookie sheet to wire rack. Change the colored sugar to match your special occasion. No almond extract? 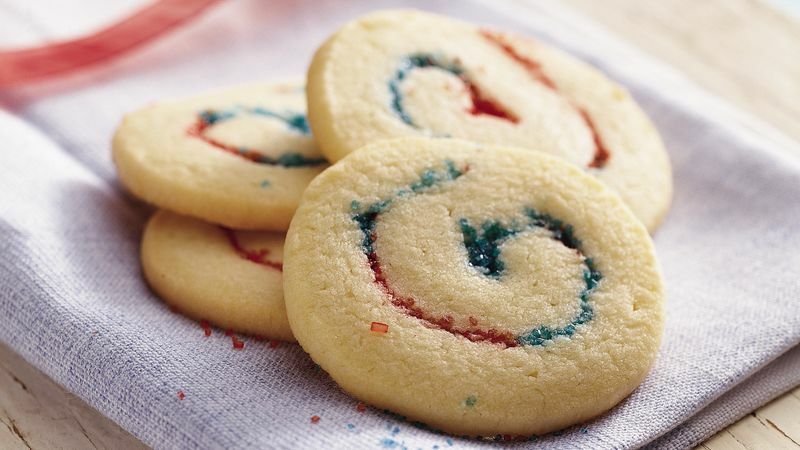 Use vanilla for a classic sugar cookie taste.